Surgical tool localization is an essential task for the automatic analysis of endoscopic videos. In the literature, existing methods for tool localization, tracking and segmentation require training data that is fully annotated, thereby limiting the size of the datasets that can be used and the generalization of the approaches. In this work, we propose to circumvent the lack of annotated data with weak supervision. 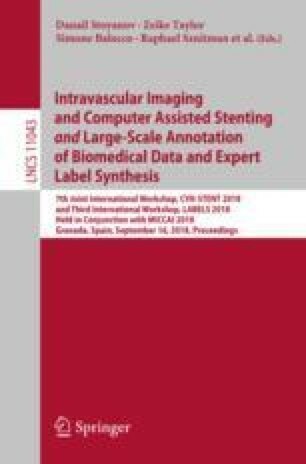 We propose a deep architecture, trained solely on image level annotations, that can be used for both tool presence detection and localization in surgical videos. Our architecture relies on a fully convolutional neural network, trained end-to-end, enabling us to localize surgical tools without explicit spatial annotations. We demonstrate the benefits of our approach on a large public dataset, Cholec80, which is fully annotated with binary tool presence information and of which 5 videos have been fully annotated with bounding boxes and tool centers for the evaluation. This work was supported by French state funds managed within the Investissements d’Avenir program by BPI France (project CONDOR) and by the ANR (references ANR-11-LABX-0004 and ANR-10-IAHU-02). The authors would also like to acknowledge the support of NVIDIA with the donation of a GPU used in this research.